If you're like most of us, you can probably name the processor in your PC (Intel or AMD, Celeron or Pentium), maybe how much RAM it has, and maybe how big the hard drive is. But, there is much more information available about your computer and Speccy can show you all of it. 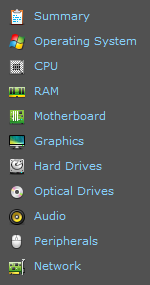 Whether you're curious about your processor brand and model, graphics card, operating system, or other software and hardware you've got installed, Speccy can give you detailed reports and graphs to give you instant information about any modern Windows-based PC.